The Hall was built on the site of a former skating rink which was situated next to the Plough Hotel. The Hall was stated as being 150 foot long by 60 foot wide and 35 foot high. The upper portions of the building were said to have been made of glass and the lower parts could be opened during the summer months. The Hall was later renamed the Victoria Theatre of Varieties, but on the 3rd of September 1894 the Hall reopened as the Empire Theatre, having been refitted and redecorated, and a new stage built. In the opening Music Hall production were Paul Jones, the Sister's Abbott, Elon and Elmar, Maude Mervyn, the Olmar Troup, Arthur Combes, C. Harrison, Carlotta Davis, and the Brothers Ramlo. More redecoration occurred the following year, under the ownership of Frank Macnaghten and the management of Sydney Arthur, and new scenery and curtains were added but the bill of fair was much the same. I am told that the Theatre was eventually sold to a Messrs Mulliners in 1903 and converted into a motor vehicle workshop but I have found advertisements for the Empire Northampton up until June 26th 1919 so I'm not sure about the final fate of this Theatre. Above Right - A photograph of James Patrick Hart, of 'Hart & Rudd' in costume and standing beside a poster of their appearance at the Northampton Empire on October the 23rd. (The year is not mentioned but Hart and Rudd were on tour around the Country in 1899 so I supsect this is the year the poster was produced for - M.L.) 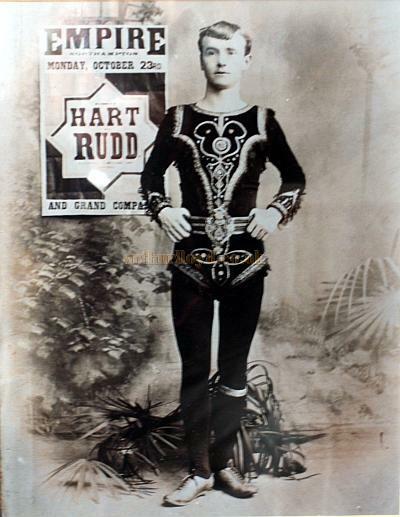 Hart was a trapeze artiste and in this photograph he is dressed in the appropriate costume for their act. His descendants were also stage artistes, such as, Margaret Hart (the Mind Reader, who appeared at the Green Room Rags Comedy Theatre in London) also her husband and sister Aziza who toured England during their time in the business, but may have been of Irish origin. James Hart died on the 11th of September 1928 aged 49, in Glasgow. - Photograph and textual information courtesy Tony Turner. If you have any more images or programmes for this Theatre that you are willing to share please Contact me.